Every year dozens of South Africans stay in Taizé and participate in international meetings. Today it is several generations who have been able to experience the common prayer and fraternity lived with the community, a parable of communion. 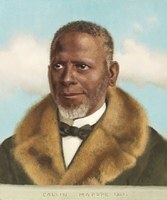 Brother Roger himself was always very attentive to their presence because of the long trial of apartheid that their country was going through, but more personally because he was still marked by a family event which he was fond to recall (“Freshness of a source”, written with Mother Teresa, in chapter 13). 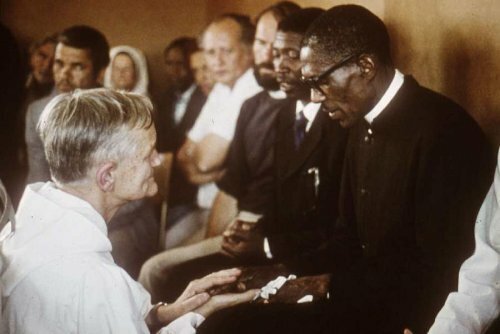 At the end of November 1978, coming from Nairobi, Brother Roger with br Alois and br John spent a few days in South Africa, Johannesburg and Cape Town. In Cape Town, a prayer meeting takes place in Noxolo, the school at the heart of Cross Road, a squatter camp where more than 20,000 Africans lived. The brothers were welcomed by Reverend Kani, other pastors and the Mayor of Cross Roads. Sister Thérèse-Pascale of Jesus wrote in their diary of the year: “As the song continues, brother Roger kneels in front of each person, the old, the young, the little children, asking everyone to make a sign of the Cross in the palm of his hand, as a gesture of forgiveness that he would like to bring back to young people in Europe. People take this very seriously, making the sign of the cross with great respect. Then the brothers are received by Fr Basil at Holy Cross, in the District Six which was undergoing a dramatic destruction. In Johannesburg, meetings and visits took place in Soweto. 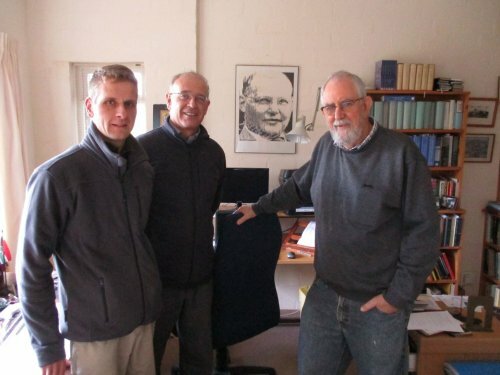 The brothers visited Bayers Naude, who was under house arrest and met Desmond Tutu, recently elected Bishop of Lesotho and Secretary General of the Council of Churches of South Africa. 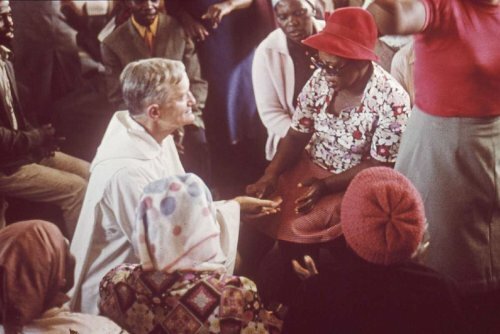 This visit to Taizé of 144 young South Africans of all races of the country and 20 different churches takes place in July 1980. Bishop Tutu who prepared this pilgrimage can not participate because his passport was removed. Bishop Bruce Evans accompanies the group. 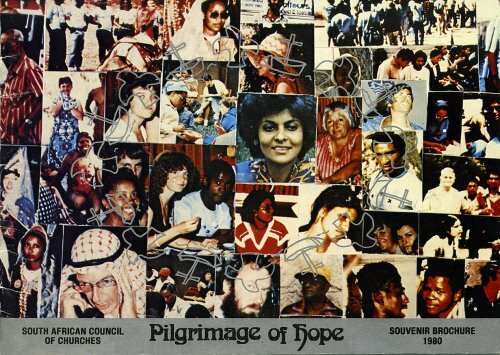 In a “Message to the People of South Africa” written in Taizé on July 19th, 1980, the participants declare that “our group of young people of all races and Christian traditions has testified to the lie of the ideology of apartheid, which claims that we can never live together. Our hope is rooted in the words of Saint Paul “There is neither Jew nor Greek, there is neither slave nor free man, there is neither man nor woman”, He has broken all the barriers that separate us from God and from one another and he has called us to a new society, based on love, justice, sharing and great respect for the image of God in each person”. “For us, this experience must have an influence and an impact for the rest of our lives”, says a pilgrim. After Nairobi (2008), Kigali (2012) and Cotonou (2016), from 25 to 29 September 2019 the Cape Town meeting will be a new African stage of the pilgrimage of trust.